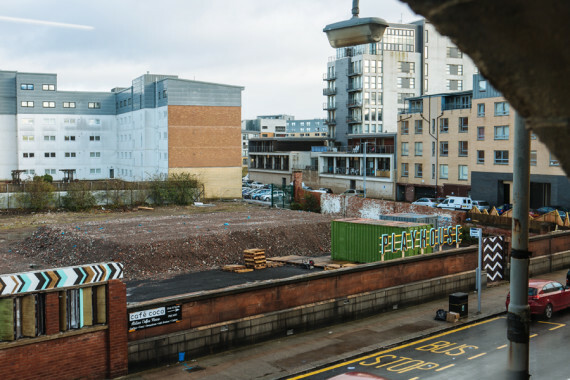 Situated on a rubble-strewn plot opposite Glasgow's Tramway, Pollokshields Playhouse is opening its gates for film screenings in a shipping container, storytelling and soup made over an open fire. Richard Taylor visits the Albert Drive site to hear more about this community project. Approaching Tramway, home to this year’s Turner Prize exhibition, it’s hard to miss the large pink signs advertising the show. Splashed across the streets of the Pollokshields area in Glasgow’s south side, they confidently declare: ‘Show Me Something New’ . As if spurred on by this call to curiosity, opposite the gallery, on an empty development plot full of rubble, something new is taking shape. There’s a shipping container, some carefully placed wooden crates and the rubble has been piled neatly at the back of the plot. You can see all of this from Tramway’s shop, which looks out across the street. Before October, the view was just a derelict wall but now it is a considered piece of urban art designed by mural curators ReCoat, which cleverly uses reflection to open up the space behind. 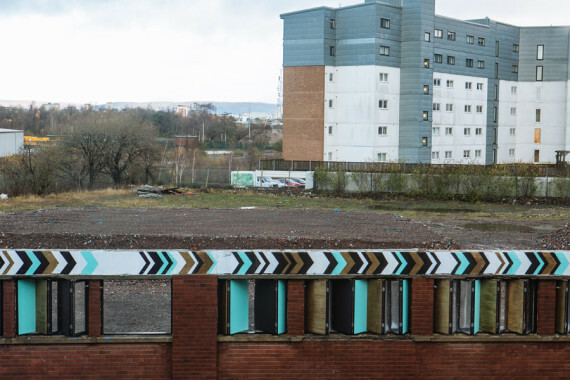 This intervention in Glasgow’s rugged urban landscape is not an extension of the Turner Prize and it’s not a beautification mission to make the area more appealing during the three months of the high-profile exhibition. It is in fact Pollokshields Playhouse, a community arts project set in motion by Pollokshields Community Council. Playhouse launched in October with a series of steering groups bringing together local people with ideas. 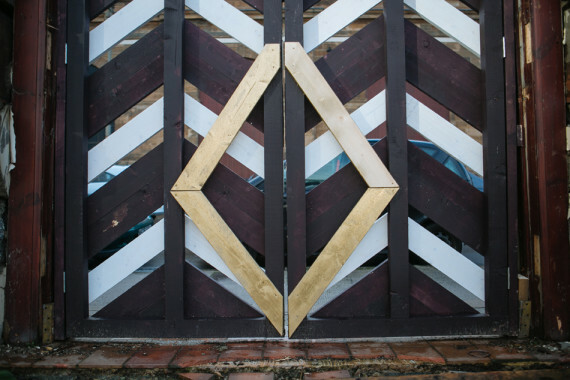 The project is led by Ria Din (founder of the community garden project East Pollokshields Quad), Pollockshields Community Councillor Bill Fraser, architect Lee Ivett, artist Rachel O’Neill, and Michelle Montgomery Masters, who is leading on community engagement. It plans to be a springboard for artists, designers, and food and film enthusiasts to test out ideas that could have more longevity within the community afterwards. As an artist, O’Neill is no stranger to socially-engaged working. She led on the large-scale participatory arts project Albert Drive from 2012 to 2013. Albert Drive itself cuts through Pollokshields (Tramway is at number 25) and acted, explains O’Neill, “as the backbone” for launching different community projects, ending in a symposium at Tramway in October 2013. It’s O’Neill’s job to garner a multi-disciplinary approach for Playhouse, inviting people into the process to offer whatever skills they have. But while Albert Drive was about knocking on doors, the Playhouse site is developing in modular stages, with each new development aimed at exciting the curiosity of local people. ReCoat’s mural artwork became the starting point for this, followed by a shipping container for meetings and events, then wooden crates to make the site navigable. For its Winter Festival on Sunday, there’ll be ‘Pollywood’ film screenings in the container, plus storytelling and soup made over an open fire. There is a sign too, designed by recent Glasgow School of Art Communication Design graduate Kat Loudan. Richard has worked for a-n since 2009; he works for the Online Content Team and writes for a-n News, regularly publishing interviews with members. He is based in Glasgow. He also works freelance in copy-editing, proofreading, sound editing and teaching. For more information see the Freelance work section of his website. His art practice is embedded in writing, and visual projects are narrative and research led. Projects have resulted in solo exhibitions and publishing in volumes such as Gnommero, which he co-edited. In 2010 he coordinated Transmission Gallery’s archive and resource room. In April 2015 he undertook a research residency in Art Writing with Edinburgh College of Art and Edinburgh Sculpture Workshop. Richard completed the MFA programme at Glasgow School of Art in 2017.